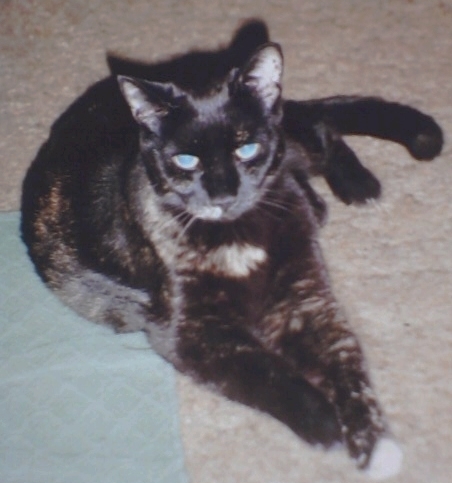 Melissa's Mochas, Mysteries and Meows: Grain-Free Cat Food: Is It the Right Choice for Your Cat? Grain-Free Cat Food: Is It the Right Choice for Your Cat? My natural instinct when faced with a problem is to research and hoard information in order to move forward. Over the past 10 years I've lived with two cats with serious health issues which required me to learn everything I could about their disorders, most importantly with regards to their diet. Now that Truffles is in my life, the youngest cat I've ever adopted, it's my mission to keep her healthy and happy for many years to come, therefore adding another layer to my study of feline nutrition - to find the best diet available for a young, growing cat. When the wonderful people at Hill's Science Diet chose me as one of 25 cat bloggers to share information about topics such as Grain-Free Cat Food and Nutrition for Aging Pets, I was given a fresh opportunity to learn even more about subjects that are extremely important to me. As pet parents, we all want what's best for our pets, and the fact of the matter is, there's no "one size fits all" in cat food. Grain-free cat food is certainly generating a lot of buzz lately, but what is it and how do you know if it's the right choice for you and your cat? 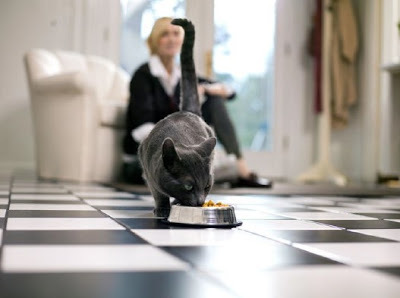 Grain-free cat food was developed for cats with allergies or stomach sensitivities due to corn and other grains which can result in itchy, dry skin and upset tummies. Grain-free does not mean carb-free or that the food is high in protein. Grains are replaced with ingredients such as sweet potatoes that provide similar or even higher carb levels, allowing for grain-free foods to still provide complete nutrition for your cat. Grain free or not, the most important factor in choosing a cat food is determining that it's nutritionally balanced. Nutrient excess or deficiency can lead to health problems. I found this article from Hill's very interesting, listing the optimal nutrients in cat food and their benefits. Here's the exciting news: NEW Hill’s® Science Diet® Grain-Free cat food offers the precise balance of nutrients your cat needs for optimal health without any grains! Plus, it’s made with REAL CHICKEN as the FIRST ingredient and no artificial colors, flavors or preservatives. The grain-free natural ingredients in Science Diet support healthy kidneys, immune system and good vision while providing nourishment for a radiant and lustrous skin and coat. Prebiotics promote nutrient absorption and digestive health, too. 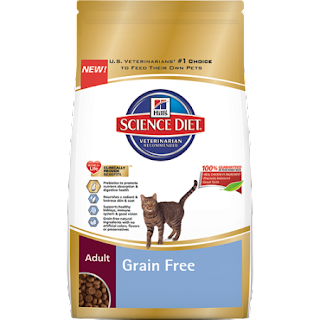 It gets even better...you and your cat can enter to win 1 of 4 10 pound bags of Hill’s® Science Diet® Adult Grain-Free cat food. Simply leave a comment with your email address (4 separate winners, entries are limited to the USA and Canada, ending 9/15). Let Hill’s know how much your cat loves their new Grain-Free food! We feed grain-free and can't wait for our sample. I would love to have my cats try this food. Thanks for the giveaway. I don't need a sample, but thank you, as we are happy with our pets' food, but I just want to agree with the post that our pet dogs and cats do not need corn in their diet, they didn't eat it in the wild in the past, and they don't digest it well so it can make them sick. Carbs like sweet potato and oatmeal are a better choice if you don't want corn in their diet. Thanks for sharing this. Grain free is best if you can manage to feed it. I always wonder which food is the best for Piper..So many options and some he takes to and others he doesn't...Thanks for the info. We'd love to win a sample. Gizmo would love to try a package of this new Kitty Food. I'd like to win this for my local shelter. My kitties would be interested to try this. Thank you for this helpful information. Ingredients are so very important to look at when picking out a cat food. it's so important for cat to get a proper diet. what is the best grain free dry dog food? This blog is having the very nice information about pets. Here we can have all the information about it.